August Thiry, writer & lecturer at KHM College Mechelen - BELGIUM, finished an elaborate monograph on the Assyrian village of Hassana at the foot of Djudi Mountain in Southeastern Turkey. The book was written in Dutch. It contains the detailed history of the village and deals with the actual situation of the Hasnaye in the Belgian town of Mechelen, where the people of Hassana found a new home after the forced evacuation of Hassana by the Turkish army forces in November 1993. The author of the book MECHELEN AAN DE TIGRIS (Mechelen on the Tigris) received full collaboration from the Assyrian community in Mechelen. Melkan Ishak, a young Assyrian from Hassana living in Mechelen since 1983, introduced August Thiry to the Hasnaye in their Belgian Diaspora. The book honours the Assyrians of Hassana who preserved their own culture, language and religion for so many ages, even in violent modern times. 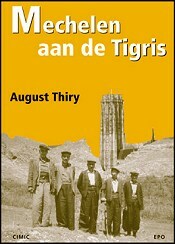 MECHELEN AAN DE TIGRIS contains 183 pages, with maps and unique photographs. It was published by CIMIC-EPO in June of 2001 and was fully supported by the Flemish Fund Pascal Decroos for Investigative Journalism. Copies of the book in Dutch can be ordered at cimic@khm.be or via jos.hennes@epo.be.